From its private, 11 acre setting to its expansive mountain and ocean views, this remarkable property offers an effortless and enviable modus vivendi. 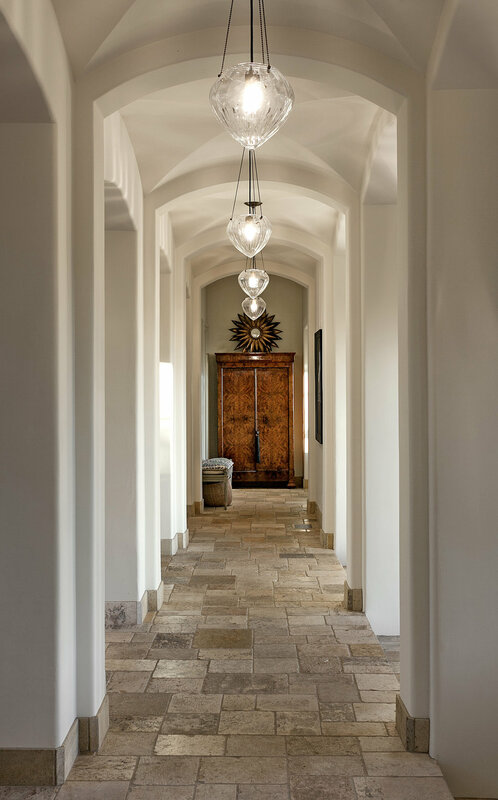 Through a graceful revival, this newly reimagined Tuscan villa recently entered the premier echelon of design. Balancing and celebrating opposing elements, this incredible residence is refined, rustic, sophisticated, airy, grounded and all the while aglow with natural light. Originally crafted by the architectural dream-team of Harrison Design and Giffin & Crane, this gracious estate is a thoughtful study in everyday elegance. A creamy palate skillfully layers shades of white, linen and soft taupe to create an exquisite foundation that lets the many custom details shine. As the light evolves throughout the day, so too does the feel and beauty of the home. Explore new depths to your surroundings as softly lit morning walls wane into dreamy evening shadows and witness the interplay between subtle styling and dramatic spaces. Throughout the home remarkable details come together to create a timeless composition. Ancient imported Media stone anchor the floors while an incredible, hand-painted, lyptus wood ceiling crowns the formal living room. Reclaimed beams and barrel-vaulted ceilings define the open family room and compliment to the dining room’s chic white wainscoting and the newly remodeled, Carrera-clad kitchen. Irresistible! Outside, the extraordinary, open-air pavilion overlooks the sparkling pool and spa, and offers breathtaking mountain and ocean views. Whether this is where you read your morning news over a cup of coffee, host dinners or enjoy a nightcap under the warm glow of the moonlight, the amazing space will quickly become an integral part of your everyday routine. The lavish first floor guest suite has a private entrance from the garden. A hand-crafted, 200-year-old chestnut oak staircase ascends to the home’s second level. Here, the sumptuous master suite, designed to capture the remarkable ocean and mountain views, creates a haven for relaxation. A barrel-vaulted ceiling lends to a light, and airy feel while French doors open to a private terrace that overlooks the Santa Barbara harbor and lush Montecito hillside. The Master suite includes a wonderful office with treetop views. A secondary stairway descends from the east wing of the home to the entertainment level that is full of delightfully flexible spaces. Graced by a temperature-controlled wine cellar, well-equipped media room, and a sunny gym, these engaging destinations help turn this already versatile home into an all-inclusive estate. Completing the lower level is a beautiful guest room with a full bath. Adjacent to the pool, a stone patio with an outdoor fireplace, grill and dining area offers an ideal place for informal gatherings. Just beyond, a formal rose garden, vegetable garden, and wildlife conservation area further establish the estate’s magnificent and secluded feel. On the north end of the property, just out of view from the dual garages and detached office, lies a private and peaceful guest house, built with the same unsurpassed quality and attention to detail as the main house. Surrounded by a beautiful orchard and drought-tolerant landscaping, this wonderful retreat offers guests a private Santa Ysidro Ranch-style experience. This gracious estate with its impeccable design, stunning views and effortless elegance has everything on your wish list and more. Enjoy the best of coastal California and rediscover the Mediterranean in the Montecito foothills.